“Ursprung” is Pantha Du Prince (Hendrik Weber) and Stephan Abry. The pair previously worked together when Abry contributed “sound sources played on prepared instruments” for Pantha Du Prince’s exceptional album “Black Noise”. “Ursprung” (German for origin) is a flawed release, it seems based on alternating a few standouts with tracks that fulfil an experimental role but don’t deliver an exciting listen. Yet it deserves a place on this list for the five tracks that provide a union of beautiful melodies, emotional depth and high production values. ‘Mummenschanz’ is a gentle track that weaves minimalist guitar chords and phrases into ambient textures above a pattering bass and snare drum rhythm that sounds like a relaxed Neu! cut. After a short measure of interplay between guitar and bass frequencies ‘Ohne Worte’ evolves into an uneasy groove of guitar phrases that are pulled along by a thudding bass drum, percussion and metallic textures which build to a frenetic climax. ‘Exodus Now’ is the album’s centrepiece: dense with guitar chords, icy synths, Neu!-inspired rhythms and buzzing noise. The hand of Hendrik Weber can be heard in the fleet-footed hi-hats and bell-like percussion. A move to African-sounding percussion and a solid melody halfway through the track adds an extra dimension. Texturally and atmospherically ‘Exodus Now’ is mesmerizing, a true standout. ‘Lizzy’ is the closest thing on “Ursprung” to what could be called technowith its sort-of danceable bass line and complimentary techno drum rhythms, percussion adding a frenetic touch underneath a playful melody. On ‘Kalte Eiche’ a clap and glistening synth arpeggio are interrupted by a thundering bass drum and stuttering snare rhythm. Clipped male vocals sit above a harmonising second male voice all the while its stuttering rhythm refuses to slot into place. These five tracks contain emotional resonance coupled with stunning atmospherics and textures, motorik rhythms and delicate minimalistic guitars underpinning it all. Kompakt pioneers Wolfgang Voit and Jörg Burger continue their long friendship with Mohn, a new project that comes with a self-titled album. In an effortless synchronisation of its parents’ styles “Mohn” (poppy in German) is full of atmosphere and sustained emotional resonance. The album contains nine tracks that could be an aural representation of a Casper David Friedrich painting: barren landscapes and colossal, other-worldly forces of nature erupting or the sound of the unnamed apocalypse that dominates Cormac McCarthy’s The Road. This is most apparent on ‘Schwarzer Schwan’, which begins with a ghostly synth and an immense bass drum that thunders under a delayed, drifting melody. The intensity rises as a second synth melody comes in and out of view. Male and Female voices enter singing held notes all the while that heavily reverbed bass drum thunders. Others are moments of fragility and beauty; any abrasive edges have been erased. Neatly sitting alongside Voigt’s exemplary work as GAS is ‘Ambientöt’, thanks to the long reverb tails that seep out into soft, sparkling atmospherics meanwhile ‘Saturn’ evolves into a track of delicate percussion and textures that flutter like a bird’s wings, recalling Cluster’s “Sowiesoso”. Flickers of the style of techno Voigt and Burger had a hand in creating can be heard in the sensual, slowly unfolding ‘Seqtor 88’ or ‘Ebertplatz 2020’, a wonderful decelerated ambient/techno track with a beautiful synth part that drifts in and out, gradually building to an intense yet sombre climax; full of atmosphere and emotional resonance. On the haunting and unearthly ‘Wiegenlied (lullaby), the listener is brought back to an uneasy sense of dystopia: a lone cavernous bass drum signals the album’s end, it is a final death-knell of a human-inhabited world and the beginning of a post-human one. Added together, “Mohn” couldn’t be anything other than a Kompakt release – possessing fleeting tension strong enough to upset the glistening ambient clouds and expansive minimalism. The main feature of ‘Landscape’ is a slow, muted melody that swells underneath hissing and thudding drums that are classic Dettmann. Their syncopated shuffle evokes a broken electro rhythm. Though it’s uncharacteristically subdued for Berghain’s master of thunderous techno, an unsettling cry that repeatedly rises from the mix is the embodiment of the agony and ecstasy of peak hour. ‘Landscape’ is the kind of track designed for a skilled DJ, like Dettmann, to build a set around; a track that is capable of providing surprising twists for years to come. The accompanying remix by Answer Code Request whips the track into a fever of tension, the bass lines punches harder, a syncopated 909 snare comes to the fore and that female cry is unbearably loud. It’s a remarkable track though even at high volume it feels strangely distant as if the listener is hearing it emanate out of Berghain’s lauded walls rather than from the centre of sweaty elation. This “SPRING EP” by King Felix (Laurel Halo working under a name taken from a previous EP) carries on the thread of the “Hour Logic EP”, notably the accelerated beats and ecstatic cries of ‘Aquifer’. The first three tracks, ‘SPRING01’, ‘SPRING02’ and ‘SPRING03’, are reconfigurations of the same instrumentation and theme, one that heavily references early nineties Detroit techno, in particular Drexciya’s underwater world and the sheen of early Model 500. Their rhythms are restless and shuffle constantly. Halo races the drums forward then scales them back to allow piercing synths to sit atop. The vast organ samples that screech through the opening of ‘SPRING 01’ are anchored by a visceral beat and razor-sharp synth textures. Only on the dramatic ‘SPRING03’ does she let a percussion-filled, 4/4 techno beat dominate. The final track, ‘FREAK’, is a collage of drones. Its sagging bass line looms underneath a quivering synth pattern and Halo’s submerged voice which merges into stretched-out chords. “SPRING EP” is coloured by its immediacy, moments of frightening suspense and an almost aggressive purposefulness. Though the four tracks string together as a narrative arc each presents a different personality and it is Halo’s ability that imbues the collection with cohesion. With his debut album “Hive Mind”, Ital disrupts and stretches the signifiers of techno and presents something that sits between the context of dancefloor and home listening. Starter ‘Doesn’t Matter If You Love Him’ takes those lyrics from Lady Gaga’s ‘Born This Way’ and chops and repeats the line until it becomes a faintly absurd mantra which then dissolves into a glitched drone. ‘Floridian Void’, a highlight, is a dark techno track containing an unsettling low end, queasy synthesisers, stretched-out vocals and a clap/hi-hat pattern that never quite slots into a liquid groove. Ital’s corruption of techno structure provides a thrilling yet disorienting experience, across “Hive Mind” there is an unshakeable sense of uneasiness: the drums push yet don’t flow with a danceable ease and bass lines swing nauseatingly. Only until the final track, ‘First Wave’, is the listener provided with a breather, an ecstatic release of booming bass drums, a hands-in-the-air 303-aping bass line and rapturous synths; a blissful finale to “Hive Mind”. Outside of techno and wider dance music, the next clearest influence is the kosmiche musik of Cluster and Harmonia, which can be heard in the rising and falling harmonies in ‘Israel’. Many of the reviews of “Hive Mind” have discussed the album in analytical/academic rather than music/production terms, such as finding dystopian analogies within the paranoia-inducing elements that pervade ‘Privacy Settings’ to a life half-lived on computers or technology’s fast-forward-paced advancements. Yet to see and appreciate “Hive Mind” by its intelligent use and abuse of dance music signifiers increases the album’s longevity and emotional response and makes for a more satisfying and complete listen. Slotted between Kompakt’s elegant techno-pop and US dance music releases such as Laurel Halo’s output and the King Felix “Spring EP” (Laurel Halo’s pseudonym), “Blondes” captures a range of emotions and moods. Each pair of tracks are two versions of the same thematic idea, reflected in the paired song titles: ‘Lover’/‘Hater’ ‘Wine’/‘Water’, ‘Business’/‘Pleasure’. Similar to Kompakt’s model, the tracks’ dance elements are complimented by rich atmospherics and luxurious synths. Each track bears the duo’s extended, rippling approach to house and techno as do the slow builds and heady releases that contain a patient construction of melodies and texture. ‘Lover’ opens the album with a Meredith Monk sample folded into a strident piece of late-night electronica. ‘Wine’ is calmer and smoother, a lithe vocal-filled track that flows into its partner, ‘Water’, a refined “Autobahn” recline that would fit beautifully in any Michael Mayer set. The Kraftwerk-esque ‘Business’ is set against the dark, subdued ‘Pleasure’. One of the most intricately constructed tracks is ‘Gold’, which follows its 4/4 guide through arpeggios, the distant sounds of percussion and Berlin techno melodies. ‘Gold’ and its pair ‘Amber’ glow in the distance, creating the album’s beautiful ambient conclusion. “Blondes” is a singularly impressive piece of work that enthralls and captivates. Claudio PRC’s debut album “Inner State” takes us deep into the abyss. It is a minimalistic world of profound and effortless deep, hypnotic techno and one that is filled with heavy atmospheres, foggy dubs and unrelenting beats. Claudio’s love for techno and production skills is displayed with confident poise. In his own words, “In most of my tracks, the electroacoustic side plays the more emotional role, where the atmosphere created by the sound research and processing are my means to tell a story, while the rhythm reveals my natural matrix of energy I use to give life to these stories.” Opener ‘Echoes’ is a pitch black techno track with a relentless bass line that fold into waves of static and hi-hats. Intense, snapping percussion tops a droning bass line and cloudy textures in ‘Transparent’ and beat-less ambient track, ‘Leave’, provides a reflective moment before the vitriolic beats of ‘Radial’ kick in. With “Inner State”, Claudio PRC shows great potential while Munich-based label Prologue maintains its status of championing high-quality techno artists. Named after the mammal native to the Pacific Northwest where Rafael Anton Irisarri (The Sight Below) and Benoit Pioulard hail from, their new collaboration as Orcas blends poignant, twinkling pop songs with shuddering masses of electronic sounds; a fusion of song-writing with ambient minimalism that stands somewhere between the piano-based modern compositions of Peter Broderick, the Field’s highly emotive techno and GAS’ subdued beats and stately atmospheres. ‘Pallor Cedes’ sets the tone of the self-titled album with rising and falling drones and a clipped guitar rhythm sitting under softly picked acoustic guitar and Pioulard’s aching repetition of the phrase “like coming up for air”. “Arrow Drawn”’s clever use of vocal double tracking and harmonies slowly seep into the listener’s ears as quiet acoustic guitar and piano merge into ‘Standard Error”s floating loop of sighs. Calling to mind GAS and Irisarri’s work as The Sight Below is “Carrion”, an unhurriedly evolving hymn that encompasses a distant beat, echoed piano parts, an irregular guitar chord and Pioulard’s gauze-covered sad-eyed voice. A standout is their sublime, glacial cover of Broadcast’s ‘Until Then’, a poignant tribute to the untimely passing of singer Trish Keenan. Continuing the album’s use of piano, the track is built on a close-mic’d delicately played piano which frames Pioulard’s reflective vocals. Dark tones that lurk beneath the surface surge to the fore three minutes in compacting everything under coarse static until a sudden drop back to a solo piano, making for an emotionally charged song. Across the album Benoit Pioulard’s vocals glide along amid quiet piano and guitar notes and backing textures that rise and fall in gentle interplay, vinyl crackle and natural reverb adding an important touch of atmosphere. “Orcas” is a beautifully dignified album that summons a sense of space, understated progression and emotional depth. Reform Club sits in a dreamy, foggy haze of serene melodies and reflective emotion. It’s comforting and inviting while deeply tender, the meaty production gives the tracks a thick texture. The album’s nine tracks sit together in a unified way; cleverly avoiding homogeneity – a result of meticulous compositions and the freedom Claro Intelecto’s new label Delsin has offered. Opener ‘Reformed’ matches ‘Voyeurism’ (from the “Second Blood” EP) in pace and style. Metronomic hi-hats push the tempo to 120 BPM (‘Reformed’ is the fastest of the nine tracks) while a bouncing bass line and snatches of strings top a driving bass drum. A standout is the next track ‘Blind Side’, which sounds like a Basic Channel track for this decade: a deep bass drum pushes forward a mysterious melody that is submerged under churning dub-techno percussive elements and metallic slivers of hi-hats. ‘Still Here’ takes the tempo down to 96 BPM. Reverbed percussion sits upfront, striking the listener, and melancholic, dreamy strings are embraced by the bass drum; a theme throughout the album is the depth and warmth in the low end frequencies. The beautiful, fluttering synth that appears at 3:25 in “Night Of The Maniac” is something to behold as it flickers above sonorous beats and a dark melody that is set against a counterpoint bass line. Album closer ‘Quiet Life’ features piano and fluctuating sheer pads to form a delicate, touching conclusion. Musically, emotionally and production-wise, “Reform Club” is one of the strongest, deepest techno album of the past six months. 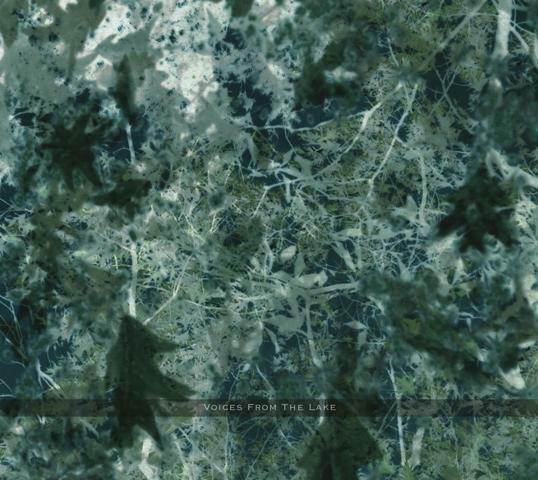 Voices From The Lake is a project born out of a friendship between Italian DJs/producers Donato Dozzy and Neel. Following on from last year’s beautiful, lucid “Silent Drop EP”, the self-titled album extends and deepens their ambient techno explorations with an emphasis on the techno component. Listening to “Voices From The Lake” is an immersive experience as the textured beats and unhurried rhythms pour with a deeply hypnotic flow. The deep wells of ambient sounds develop and unfold at their own pace, creating a intoxicating sense of tranquility. ‘Iyo’ imposes scattered hats and percussion against a humid backdrop. Its drones leads us into the next track ‘Vega’, which introduces a pulsing bass drum underneath a soothing pillows and layers of tiny hits of percussion. The pair’s reworking of the previously-released ‘S.T.’ is a revelation. After 30 minutes of bubbling and vibration, the album’s first bass line emerges, a gently ascending and descending chord progression that creates impact while remaining airy and translucent. Rhythm, texture and atmosphere are the key components of this album, creating an enveloping physical presence that asks for concentration; a meditative state of listening. “Voices From The Lake” is something that is alive and breathing. Its patterns shift and morph in minute detail, so subtly and patiently that it gives the album an unusual flow, a feeling like it’s floating. The construction is painstaking, so much so you can’t tell where one track begins and another ends.In the context of sound design “Voices From The Lake” has far more emotional resonance than most releases, it has a warmth that feels inviting. Except for the mid-album detonation of melody and beats, this album ignores techno’s linear structure by replacing the rise-rise-rise-peak-explosion-descend progression with one that places builds and falls into tiny pockets of a wider, complex canvas. Donato Dozzy and Neel have created a unique, entrancing release that supplies the closest aural equivalent to waldeinsamkeit since Pantha Du Prince’s “Black Noise”, my top-ranking album of 2010. Sonic Fiction is proud to introduce the new bi-monthly column Music Is Improper, which will focus on electronic music brought to you by our columnist Vier. When house and techno grew in exposure in the mid 1980s productions were minimal out of necessity. As sampling and programming technology developed, the music grew increasingly layered and clean. Evolution to some, unnecessary commercial crossover moves to others. Reacting against these increasingly dense productions, minimal techno artists subtracted from their productions almost everything except sharp drum rhythms and stark sequencer or synthesizer patterns and yet of all the electronic music genres, none are more maligned and misunderstood than minimal techno. It is criticised for a lack of depth and lacklustre, monotonous repetition, a disparagement that has been levelled at electronic music in its entirety, with fans of other electronic music genres quick to invalidate it, viewing it as calculated affectation. Fans of minimal (an adjective so powerful it seems to negate the need for a noun) can get it wrong too, valuing it as being thoroughly innovative and progressively new above other, busier genres, forgetting that minimalism, in its original sense, played a key role in the invention of electronic music. Without the repetition and phrasing of minimal music and the rejection of traditional compositional, notational and tonal language by its leaders Steve Reich and Philip Glass et al techno and house as we know it would not exist. Neither would electro and hip-hop – spinning the same two records to infinitely extend a loop is as minimal as it gets and yet the minimal tag is a misrepresentation. Vacant they are not; the tracks brim with colour, shade and moods, neither are artists lazy; they sculpt sounds: moulding tone, pitch and timbre. With fewer elements each is more exposed and thus must justify its existence. Sparseness permits emotions to move to the foreground, absorption of the atmospheres and textures is encouraged by repetition, rejecting traditional song structure allow the listener to enter a trance-like state, purging late night excesses. After years as the black sheep and enduring a creative slump, minimal techno found its way into the hands of a generation of artists like Ricardo Villalobos, Gui Boratto and Click Box who have reinvigorated it with incorporations of Southern American instruments and rhythms and a new generation of listeners, who were children when many seminal albums were delivered, are discovering exciting records past and present. As for the genre’s supposed lack of depth, Plastikman’s influential, and greatest, album ‘Closer’ is the sound of someone in the pit of depression; disconnected, exhausted and unemotional. The music is distant, as if approaching from outside, a place the voice is crawling to reach. Crunches, snaps and rips creep up on the listener, encasing them inside the protagonist’s oppressed mind; the microscopic variations amplify the tension. Dystopia: techno stripped to its inner core. Not exactly limp. A key text in the genre’s history is Basic Channel’s ‘BCD’ from 1996. Redefining the standard of stripped music further than their peers, the duo of Moritz von Oswald and Mark Ernestus subtracted percussive elements, leaving only reverb to swirl and decay in the vacuum created. Journalist Simon Reynolds noted that listening to Basic Channel was akin to hearing a pounding nightclub from miles away. Most of the tracks on ‘BCD’, which is a compilation of single edits rather than a true album, are without drums, aside from the occasionally-occurring propelling bass drum and melodies are replaced by weightless chords. Synthesisers replicate the codes a listener would expect to hear in techno. The intricacies are the focus rather than pumping drum patterns yet Basic Channel songs sound like techno tracks. Closely related to Basic Channel is Pole, whose trio of albums, ‘1’, ‘2’ and ‘3’, demonstrate a detached austerity, even in full-colour covers. Compositionally, Pole’s albums are kept bare; tracks are tethered by dub-specked held bass lines and an effervescence of high end. By reducing the elements so severely Pole reveals the similarities of dub and techno. Both share repetitious loops and the smallest of modifying steps – filter cutoff sweeps, hissing tapes, bouncing delay – are to be zoned in on and the clicks, pops and squeals present are now the foundation of minimal techno. The Cologne label and distributor Kompakt is considered synonymous with the genre and founder Wolfgang Voigt’s GAS pseudonym can be thought of as worship to Basic Channel. Purportedly a contemplation of German identity, GAS mutates samples of German classical music into dark arrangements held down by a simple bass drum. Sections morph and counterpoints dissolve, building an oppressive atmosphere where pops and clicks resemble stepped-on fallen branches while lost in the black forest. Although GAS’ sound isn’t overtly techno and is much bigger in size than Basic Channel, the stripped production and its rejection of structural norms is evidence of how malleable minimal techno is, which can therefore lead to misunderstandings of what it is. This ethos coupled with Minus’ nine date, nine country AV tour Making Contakt, which set out to explore themes of security, privacy and communication, blurred the lines between performer and audience by actively encouraging audience participation and interaction via technology summarizes what minimal techno is; an evolving and engaging form that is true to the founding ideology of electronic music: to push musical and technological boundaries and defy audience expectations. To progress, to challenge, to be the vanguard.